Well this old garbage truck has seen its last days. Time to put it out by the curb for the trash pickup. What do you mean you can’t fit my garbage truck in your garbage truck? I thought you were professionals! So they should make bigger garbage trucks for the old garbage trucks that don’t work any more… But then what if the big garbage trucks stop working and have to be thrown in the garbage? Consider the possibility of the universe containing a garbage truck capable of containing the universe. 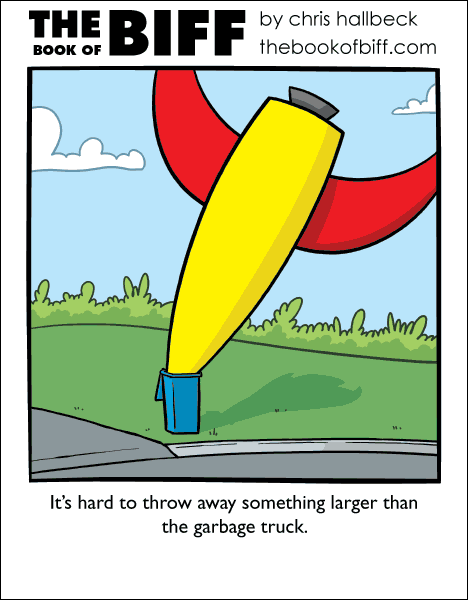 That means the garbage truck is therefore able to carry itself. Problem solved. But how do you put a garbage truck into itself? Would that be like turning it inside out? Because if the garbage truck is carrying itself, inside itself, then there must be an infinite amount of this garbage truck, each one inside the previous one…?! Don’t divide by zero. Only take the limit as n goes to zero of (a garbage truck divided by n). That way we don’t run into a paradox. No, you don’t. I ran into a dox once and it really messed up my car. I can’t imagine what two of them would do. What if you compress the garbage truck into a small cube? Then it’s a question of how many garbage trucks you can haul in a garbage truck. Ah, rocket… you have so many non-uses. Can I have his rocket? It’s really hard to throw away a trash can. That much metal, shouldn’t we be trying to sell it for scrap. Makes me think of the Universal Replicator (see K. Eric Drexler’s _Engines of Creation_ ); how can a microwave-oven-sized machine replicate itself? I guess, a piece at a time? This looks like a job for thr Junkions! DUDE, NOT THE SHIP! NOOO!